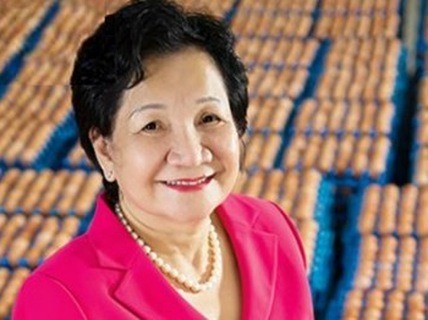 Phạm Ba Huân, also known as Ba Huân, has invested her life in eggs and has become Việt Nam’s most famous businesswoman producing and distributing eggs. She talks with Hà Nguyễn about her life and business. Inner Sanctum: Can you tell us how you first became involved with eggs? I was born in a very poor and crowded family. My parents had 8 children, and I was the second. My mother was a small egg trader. At the age of 12 I had to wake up very early in the morning to accompany her to purchase chicken and duck eggs from farmhouses in Tiền Giang, Hậu Giang and other Mekong Delta provinces, and transport them to Sài Gòn (now HCM City) to sell at Chợ Lớn Market. My mother worked very hard to earn a living to feed us. Her trade and hard work had the most influence on me. I had to drop out of school at the age of 13 to help my mother. She taught me how to foster good relations with farmers, choose fresh eggs and the value of good customer service. Despite having left school, I felt happy because I was able to help my mother and learn about the egg trade. When I was 16 my mother was taken very ill, and she had to hand over her trade to me. At such a young age, I faced many difficulties, for example I had no money in hand even though I tried to borrow from my relatives. I decided to purchase eggs on credit by meeting with each farm owner, and attempting to convince and implore them that I will pay them back right after the first batch of eggs was sold. They didn’t believe me at first, but after a little persuasion they gave me a chance. By purchasing directly from producers and selling to customers, I had my first capital investment two years later. I had money to pay producers on time, and was able to win their trust. My business quickly expanded to almost all Mekong Delta provinces, purchasing eggs and supplying them to customers promptly. In 2000, I set up a company with more than 100 workers. Inner Sanctum: What are main factors behind your company’s success? The first was using modern technology. In early 2000 the epidemic of H5N1 (commonly known as bird, or avian, flu) seemed to kill off the traditional chiken and duck breeding in the Mekong Delta. We decided to import a processing line from the Netherlands at a cost of 650,000 euros, with a capacity of 65,000 eggs per hour. We also invested VNĐ35 billion to build Việt Nam’s most modern plant in HCM City supplying organic eggs. As a result, Vietnamese customers have benefited from eggs of an international standard on quality and food hygiene for the first time. Meanwhile, farmers have been able to restore some trust to continue their traditional poultry breeding. Two years later we continued to invest more than VNĐ100 billion to import a second processing line with a capacity of 120,000 eggs/hour. Inner Sanctum: How has your company helped farmers deal with difficulties, such as the bird flu epidemic? In 2003, the bird flu epidemic hit farmers, chicken farms and egg business as a whole. I witnessed thousands of chickens and ducks dying. Many farming households had to adapt and take on other produce. My imported modern technology from the Netherlands helped breeders regain production. Inner Sanctum: Can you tell us about your company’s process of checking egg quality? We first clean the eggs, dry them and kill off any bacteria. The second part is inspecting the eggs to find rotten and low quality ones, and then covering them with a special oil to prevent further bacteria. After finishing these processes, our eggs will be stamped and packaged. All of our processes aim to ensure the highest quality and food hygiene standards for our customers. Up until now we haven’t received any complaints. Inner Sanctum: How does your company act to benefit farmers? Farmers’ living standards have been improved because we’ve signed contracts to purchase all of their eggs. In addition, we have co-ordinated with the National Centre for Agriculture Promotion to implement a programme to assist young farmers and guide them along the process of breeding. Currently, thousands of farmers have joined safe poultry breeding lines in co-operation between themselves, scientists, businesses and the government. This joint-venture model has assisted poor farmers with capital investment, baby birds, immunization, and output of their produce with stable pricing. Inner Sanctum: How do you rate the potential and opportunity for Việt Nam’s organic eggs in the future? The potential of using organic eggs is great but competition between companies is also great. There are companies investing heavily in organic eggs, which means we have to try our utmost to compete with them. Currently, we have 400 agents distributing and selling our products. This makes up 40 per cent of the market share.